Cynthia and George and the Mitchell Foundation have contributed gifts and pledges exceeding $33 million to the Giant Magellan Telescope to establish Texas A&M University as a founding partner of a consortium to development and build the $1 Billion state-of-the-art next-generation telescope, the heir apparent to NASA’s Hubble Space Telescope. The consortium is a group of universities and research organizations including, Texas A&M, the University of Texas at Austin, the Australian National University, Astronomy Australia Limited, the Carnegie Institution for Science, Harvard University, the Korea Astronomy and Space Science Institute, The Smithsonian Institution, the University of Arizona, and the University of Chicago. 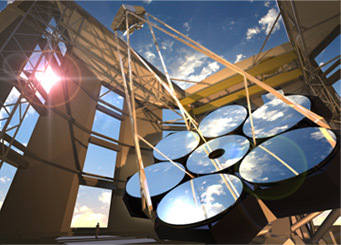 Scheduled to begin operating in Chile in 2021, with completion in 2025, the Giant Magellan Telescope will open new avenues of scientific exploration, including understanding the origin and evolution of planetary systems; witnessing the formation of stars, galaxies, and black holes; and exploring the properties of dark matter and dark energy in the cosmos.